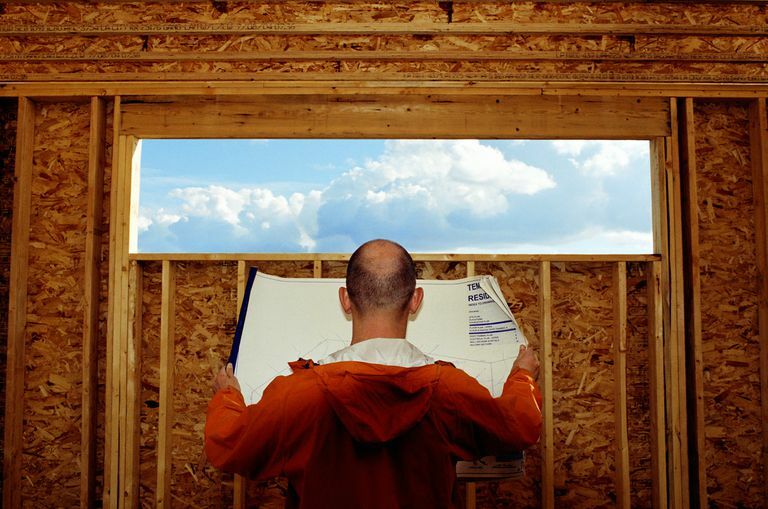 House blueprints are necessary when building a home today. Even for the older home, house plans are invaluable during the inevitable remodeling and renovation. It's every home renovator's dream: You lift a floorboard in the attic and voilà! There are the original blueprints, with dimensions, specs, and elevation drawings, showing where every window and door was meant to be originally. The mysteries of your house are solved, and you have a roadmap for repairs and restoration. For most of us, this is only a dream. In the early 1900s and before, builders rarely drew up the kind of detailed specifications found in modern blueprints. House construction was largely a matter of convention, using methods passed down by word of mouth. Written manuals and pattern books often contained the hazy instruction, "Build in the usual way." So, should you give up the hunt? Not yet! Here's how to find answers without tearing up your attic floor. Your first line of inquiry might be with your realtor. If your house was built in the past 50 years, the sales agents at your real estate office may be able to help you locate facts about its construction. Often they will know the local developers and be familiar with housing styles in your region. Because realtors deal with many houses inside and out, they tend to know about which stock plans were used in their locality. Other names for stock plans include catalog plans, stock building plans, stock house plans, mail order plans, and pattern book houses. Builders and developers would customize "off-the-shelf" stock plans, changing details to meet a client's needs, although a customized stock plan is not actually a custom home. Your realtor is likely to know the difference. At times in American history when single-family housing was in great demand, using stock plans could save time and money—costs escalate with changes. Many stock plans began as customized building plans for an architect's client, which is why you may see a modified Biltmore Mansion in your neighborhood. Quiz your realtor on the town's history and not just house styles. Along with talking to realtors, explore what your neighbors know. There's a reason why that house across the street looks familiar. It may have been designed by the same person and built by the same developer. Perhaps it is a mirror image, with minor differences in finishing details. Walking your neighbor's halls can be a good way to learn about the original floor plan of your own home. Stock plans are associated with production home builders, but anyone can buy stock plans and build on a plot of land. Planned and gated communities usually limit the available house styles, which are stock plans for that community. As you drive through your neighborhood, you may notice many variations on the same essential plan. Although they are not unique, houses built from stock plans can be quite lovely. Catalog houses from Sears, Roebuck & Co. and Montgomery Ward built decades ago are still popular today. Public officials should also know something about the building history of your town or city, so check in with the building inspector or assessor's office at the town hall. In most cities and towns around the world, builders must file for a permit before beginning new construction or remodeling an older home. This process ensures some standards of safety for occupants and for the fire company who protects your home. Permits, often with floor plans and elevation drawings, are usually filed in the Building Inspector's office at your local city or town hall. These documents may not date very far back, but they can be useful for learning about modifications made to your house in the past 20 years or so. While you are at city hall, ask where you can see the fire insurance maps for your area. In the United States, many fire insurance maps date back to the 1870s. At the very least, these maps will indicate the original construction material (e.g., brick, wood, stone) used for your home. A good bird's-eye view map will also provide a three-dimensional drawing of houses in your neighborhood. Sometimes there is enough detail to show the shape of the buildings and the placement of doors, windows, and porches. Compare your findings with Google maps. Local archives can exist by records retention laws—or not. Many communities maintain archives with old photographs, building plans, and maps. These records may be heaped in disorganized piles in the town hall attic—or they may be cataloged and shelved at your local library, museum, or historic commission. If you are lucky, there may be an official city or town historian who can advise you in your search. Other resources include historic catalogs. If your home was built at the turn of the century, there's a good chance the builder drew his inspiration from a pattern book. In the early 20th century, many American houses—some surprisingly complex—had humble beginnings as a Sears, Roebuck ready-to-assemble mail order kit. Others followed stock plans published by firms such as Palliser, Palliser and Company. Check out the Sears and Craftsman homes advertised in old magazines and mail-order catalogs. Start exploring mid-century homes like the many Cape Cod house plans from the 1950s and the rise of the Minimal Traditional style to 1940s America. Reading old advertisements can also give you historical context to building processes of the past. Simple floor plans for your old house, or houses like it, may have been published in real estate advertisements. Check your public library for back issues of local newspapers. Also, check farm journals and women's magazines for featured building plans. The house you're living in may not have started out looking the way it does today. Don't get off track looking for plans for a Greek Revival when your home may have begun as a Federal style. To get started, explore a summary of Preservation Brief 35, " Understanding Old Buildings: The Process of Architectural Investigation." In amongst all of this running around, continue to explore online resources. Websites like NETR Online, run by the Nationwide Environmental Title Research, LLC, continue to add public records to their databases. And remember that if you're looking for house plans, chances are that somebody else is, too. Check out some of the forums that still exist online, like Old House Web or My Old House Online. Ask your friends on Facebook, Twitter, and other social networks. If you don't have time for all of this investigation, or if you don't like to do research, believe it or not people exist who actually DO like to do this work. You can hire an expert. Blueprints may not exist, but every modification made to your home left behind a trail of evidence. A building professional (usually an architect or a structural engineer) can use field measurements and other clues to recreate the original plans. Now that you know how your house used to look, the real work begins... renovation!